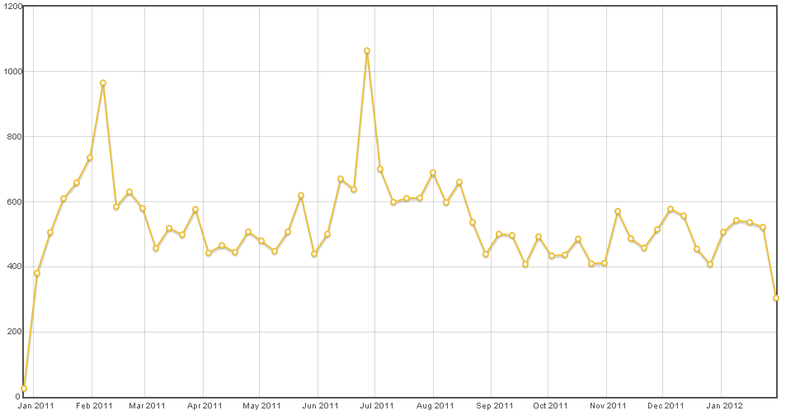 Our Average Question Score is Down a full point over the last year, whats going on? 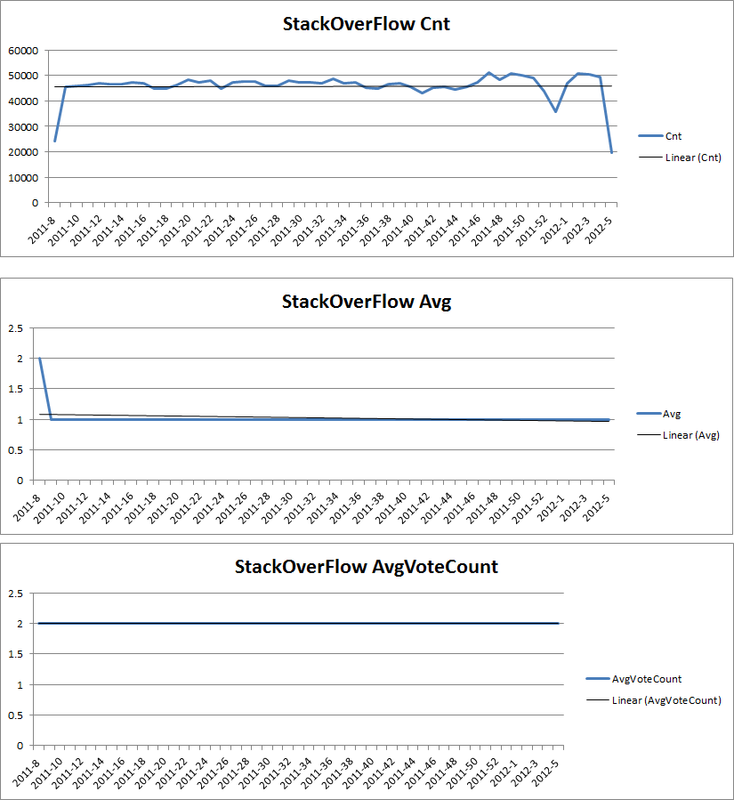 Edit: I Updated the SQL and Added Average Vote count.. The site scope was changed dramatically from its original proposal, without the consent of the Programmers community, which drove many users away. Since then, strict enforcement of keeping questions on-topic with the new site scope, combined with the fact our site name doesn't match the FAQ has been causing a lot of users to misunderstand what the site is meant for, and to lose interest and stop asking/answering questions. And here's a graph of new questions asked. It is going down hill fairly steadily for a while now, and I don't believe it's because all the good questions have been asked/answered. I think it's instead people being aware of stricter rules, and/or being uncertain about if they should post something for fear of just getting downvoted and closed. It should be noted that the above graph shows posts which were closed as of 5/10/12 (which is when I noticed I was including answers in my old graph). To view a graph of actual open/close post history, use this query, which was added in May. It should also be noted that some of the larger spikes of posts getting closed can be attributed to the massive cleanup that some users undertook. 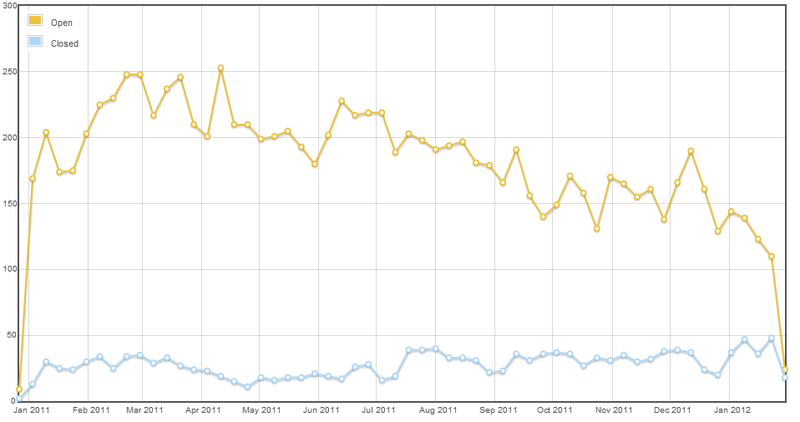 Our number of votes is also declining, which is the result of less user participation. I can't speak for others, but personally I've gotten frustrated with the way our site is going and have kind of given up. I don't think I'm alone either judging by questions on meta, and the disappearance of several formerly-active users. 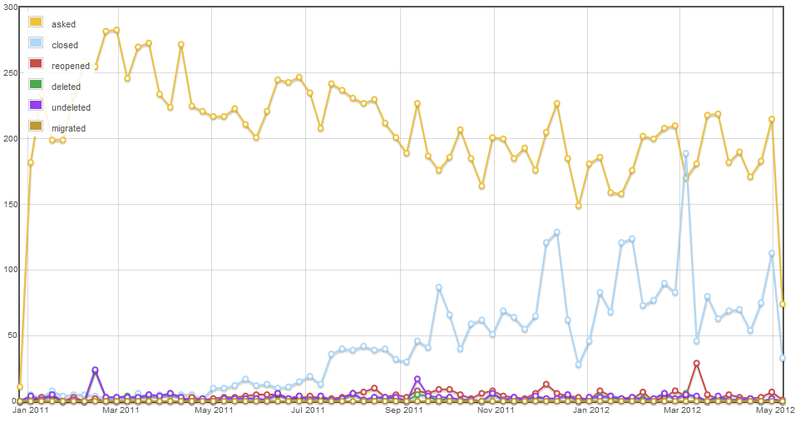 This site is yours, so you can run it however you want, however I strongly believe that the downward nature of the graphs is caused by a lot of misunderstanding and confusion about the site scope, and the way SE treated the Programmers community when they decided to change the site scope without their consent. The site was meant to be a site for programmers about programmers, and it has since changed to a site for programmers about software development only. A lot of old active users have lost interest, and a lot of new users don't understand the site scope and ask low quality questions. I agree with Rachel... As new sites pop up its takes from this more generic one..
Has any new site proposal ever been rejected because We already have programmers? Its a fact that the number of closures puts off posters, and, it puts people off answering. What is the point of spending ten minutes carefully considering the question, re-wording, correcting your spelling (or not, in my case) only to find the question closed. Ultimately it puts people of visiting the site. Programming and related professions (DBAs, Analysts, Systems Architects etc.) are fairly unique, its techie a bit like engineering but we don't have rules engineers have to follow. There is no empirical way to judge a programmers work. Even stuff that plain doesn't work may be good quality programming which was specified poorly. If we cannot discuss these type of topic here, whats left? 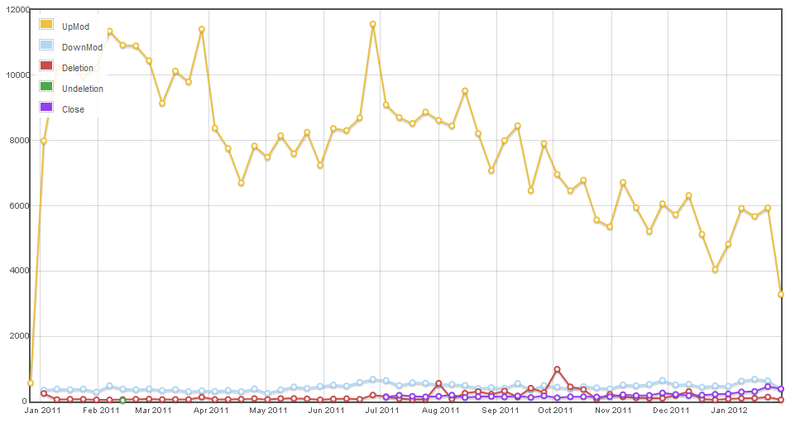 This is a trend we're seeing on Stack Overflow too. If the rate of increase in questions is greater than the rate of increase in users so there are less votes per question available. All of the graph results can be explained by the consistent, persistent effort by the community and the moderators to remove bikeshed questions. I personally think this is a good thing. While the potential audience is smaller, the audience that remains has a higher percentage of experts in the field, and not just people who want to talk about the "best eraser for programmers." The question scores are merely falling in line with the actual average quality of questions in Programmers. There have always been bad questions on Programmers, but up until recently, more active users finally understand the scope of the site and care enough to participate in meeting that vision. No offense Pierre, but we were all fresh users at one point before we really understood what this place was about. Given that I rarely downvote answers, I think I subtracted 600+ nice shiny points from total questions score. Why are there so many closed, on hold, and down voted questions here? Is high-profile user attrition a sign that a subjective SE won't work? Are people less easy on the up-vote button? Are you fed up with all the frustration that come here on meta? What are the guidelines for down-voting? Are chronic down voters good for the system? Why was this question voted down? Why are so many questions down voted?